This page is about the Russian fighter Yak-9P. For other uses, see Yak-9 (Family). The Yak-9P is a rank IV Soviet fighter with a battle rating of 5.0 (AB/RB) and 5.3 (SB). It was introduced in Update 1.31. 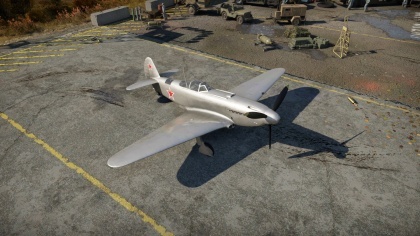 When stock, the Yak-9P will be pretty similar to the Yak-3P. Three 20 mm cannons which are good taking down fighters and heavy fighters, but its still quite hard to kill big targets such like B-17. When unlocking the 23 mm cannon, the damage is higher, but it carries significantly less ammo than the 20 mm. However, when equipping the 37 mm cannon, the effectiveness of the fighter increases significantly, having weaponry close to MiG-9 or MiG-15. The 37 mm cannon has an excellent rate of fire, won't jam easily, has great accuracy and carries a good amount of ammo. A single hit can kill a fighter or heavily damage it, and big bombers like B-17s will be killed with one or two hits on a wing. 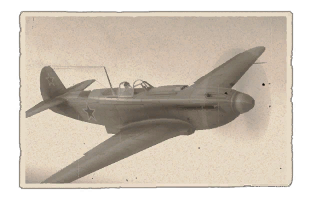 The Yak-9P is best when used in turn fights and boom and zoom attacks, but speeds of 700 km/h or higher can end on low control response (making it hard to recover) and wings breaking. It can climbs best at 20 degrees and 10-15 above 4000 m. It has great engine performance and will sightly overheat after long WEP use, but will cool down quickly when reducing to just 85-90% throttle. One rather unique feature of the Yak-9P is the modification possibility for ones own liking. The default setup is has got a centerline B-20M. It is virtually the same as the B-20S and utilizes the same belts OR one can switch out the 20 mm for a nasty 23 mm. The suggested modification by many pilots. The NS-23 has similar ballistics to the installed 20 mm cannons but packs more punch. Fortunately the rate of fire is lower for the NS-23 and both arms will run out of ammunition at roughly the same time. For the fellow pilots who still dreams of the Yak-9T: The 37 mm "howitzer", it is a deceptive package though! The N-37 is not the NS-37 from the Yak-9T and lacks any decent anti-armour shells, losing 20 mm of penetration. Two shells were also lost from the 9T, but on the bright side it still delivers painful HE warheads to the enemy. Four upgrades are of importance: Offensive 20 mm, Compressor, Engine and Engine Injection. During this grind the second weapons profile (NS-23) can be easily be obtained without wasting time or XP. This page was last edited on 7 April 2019, at 11:07.